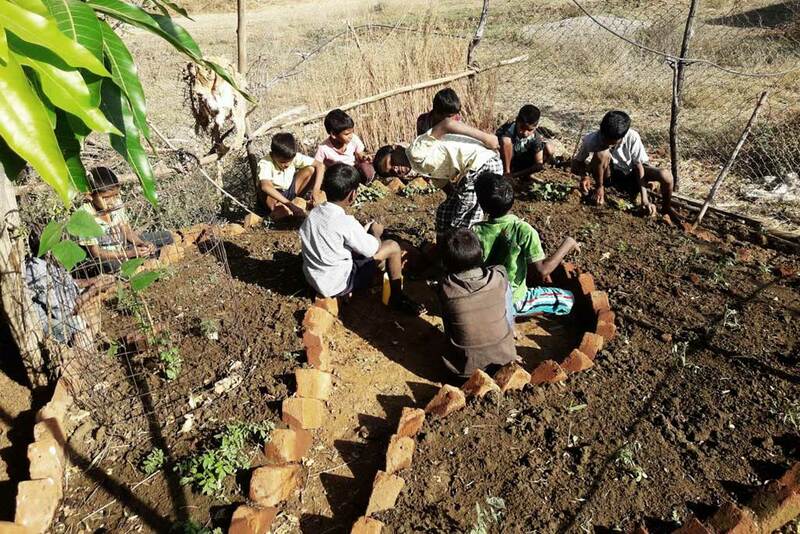 There is creative and productive fun going on in the Amrita Kitchen Garden in Kodur, Telangana, one of the places where Amrita SeRVe activities have more recently started. Every Sunday morning, the children join with the Amala Bharatam team to find new ways to care for the plants and soils. A Gangamma Mandala, also known as a key whole pattern bed, has been made with compost and mulch. In the middle of the Gangamma Mandala, the gardeners are keeping a pot under which is tied a rope that is stretched completely across the mandala. This maintains the moisture in the soil. Meanwhile, the entrance is made as a key hole so that people can enter and water the soil areas themselves whenever this is necessary. Vegetables and fruits (and weeds, when needed!) can also be plucked. Someone takes responsibility to come every three days to fill the pot. As a result, in this setting all kinds of vegetables and grains can be grown with much less effort. There is a diversity that is culminated in the choice of plants grown and where. This means that pesticide is not necessary, as the insects and the plants all find ways to complement each other. A mini eco-system is formed!